Suction Machine is used for Cleaning of Sewer Lines by Sucking out the dirt / Dust / Garbage / Other Impurities directly from chamber into its vacuum tank. Jetting machine is used to clear the blockage/choking of sewer lines by High capacity Jet throw of liquid that is store in its fresh water tank. 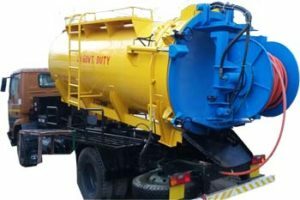 It’s easy operations, low maintenance & High capacity Suction-Jetting system helps in superior cleaning of Sewer lines with high productivity & in very less time. Provision for manufacturing suction and vacuum tank separately or combined on single vehicle. Heavy duty cylinders to Tipping the unit by help of control valve & also provision for hydraulic opening of rear door that will reducing the human efforts. High quality suction Hose, Jetting hose, Washing Hose, Hydraulic Motor & Pump are maintain the overall operations within optimum conditions. Suitable for Refineries, Municipalities, Building Developments as well as Others Cleaning Operations as required.